The Vice-Chancellor, Professor Olusola Oyewole, has encouraged Nigerians to cultivate the habit of eating cassava bread, which he noted is safe, delicious and nutritious. Professor Oyewole made this call at the 37th Annual Conference and General Meeting of the Nigerian Institute of Food Science and Technology (NIFST), held recently at the International Conference Centre, Abuja, which had as its theme Food Safety: Critical Pathway to Sustainable Global Competitiveness and Public Health. 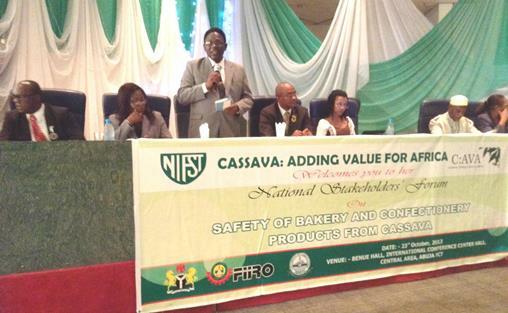 The Vice-Chancellor, in his Welcome Address during the National Stakeholders’ Forum on Safety of Bakery and Confectionery Cassava Products, said discussing the safety of cassava bread and confectionery products, derivable from High Quality Cassava Flour (HQCF), inclusive of composite flour will leverage on using cassava for the economic development of the nation through the creation of employment opportunities, increased Gross Domestic Product earnings, income generation and sustainable development. 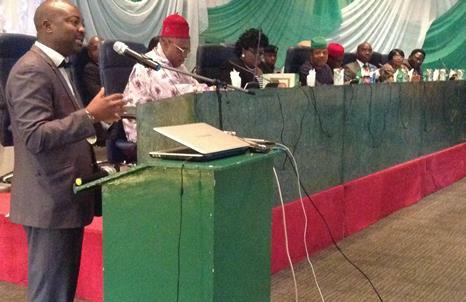 NIFST President, Prof. Lateef Sanni, giving his Presidential Address while the Hon. Minister of Health, Prof. Onyebuchi Chukwu (4th Right); Deputy Speaker, House of Representatives, Rt. Hon Emeka Ihedioha (3rd Left); FUNAAB VC, Prof. Olusola Oyewole (Far right) and a host of other eminent personalities listen. The Vice-Chancellor said that, what had been presented to Nigerians as cassava bread is safe, noting that already, Master bakers across the country were trained in the six geo-political zones on how to make the product easily available to the people. “The adoption of cassava bread and the utilization of HQCF will assist in the attainment of the national policy on food security, as well as poverty alleviation. 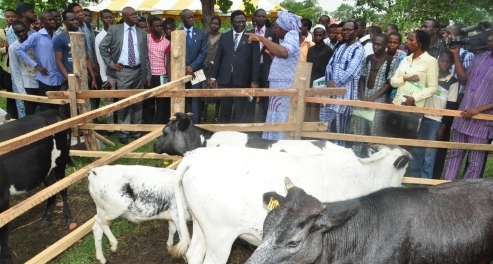 Be ready to derive more benefits from our national commodities like cassava, yam and sorghum. Be an ambassador of positive thinkers in Nigeria”, he stated. He lauded the Federal Government on its 20 per cent Cassava Bread Inclusion Initiative and the Cassava Bread Fund, under the Cassava Transformation Agenda Programme (CTAP), adding that prompt disbursement and proper utilisation of the funds should be guaranteed. Earlier, the President of the Institute and the immediate past Head, Department of Food Science and Technology, FUNAAB, Professor Lateef Sanni, had described NIFST as the body of Food Scientists and Technologists as well as Allied Professionals in Nigeria, established in 1976 as a non-profit organisation, which currently has over 10,000 members working in management and technical cadres across the country. He said that the Institute was committed to attaining its vision of providing good and abundant food for all using the abundant talents, knowledge and skills endowed its members. Prof. Adewale Dipeolu (Arrowed), savouring the delicious taste of cassava bread. According to him, “Our Institute is a strong affiliate of international and regional bodies such as the International Union of Food Science and Technology (IUFoST), South African Association of Food Science and Technology (SAAFoST) and the West African Association of Food Science and Technology (WAAFoST)”. 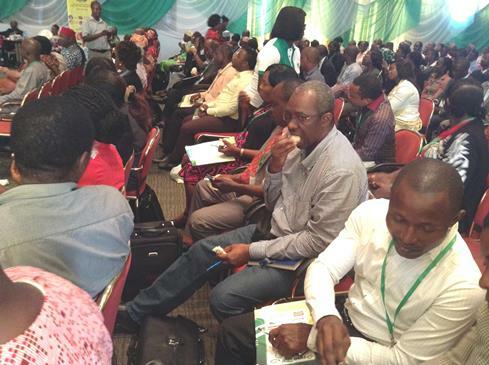 He declared that one of the Corporate Social Responsibility (CSR) programmes of the Institute involve providing the enabling platforms for stakeholders to identify, discuss and offer solutions to the problem of food insecurity by proffering solutions on how to curb hunger.